Whew! Long title! My best friend and her mom found these cupcakes on the Good Housekeeping website and suggested I make them. My husband came home that day and mentioned that his coworker was having a party on Saturday - perfect! The GH recipe calls for a plain buttercream frosting, but thought it needed a little something more. I asked around and got some suggestions, and when someone said whipped peanut butter cream cheese frosting, I was SOLD! I did a little googling to get a general idea of proportions, then threw some together for a wonderfully creamy, cream cheese-y, peanut buttery delight! Despite overbaking them a tad, the cupcakes were delicious and not overwhelming on either the chocolate or peanut butter flavor. I did, however, get a pocket of air above the peanut butter ball inside each one. I remedied this by poking through the top of the cupcake with the decorating tip, filling that space with frosting, then piping the swirls on top. 1. Prepare Filling: In bowl, with mixer on medium speed, mix confectioners' sugar, peanut butter, 2 tablespoons butter, and 1/4 teaspoon vanilla until blended. Shape mixture into 24 balls using heaping measuring teaspoons. (Balls will be sticky and don't need to be perfectly shaped.) Place balls on waxed paper-lined cookie sheet; set aside. 2. Preheat oven to 350 degrees F. Line 24 standard muffin-pan cups with fluted paper liners. 3. 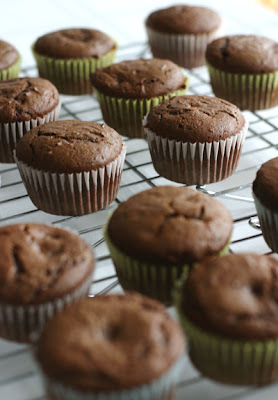 Prepare Cupcakes: On waxed paper, combine flour, cocoa, baking soda, and 1/2 teaspoon salt. In 2-cup liquid measuring cup, mix sour cream, milk, and remaining vanilla; set aside. In large bowl, with mixer on low speed, beat granulated sugar and remaining 8 tablespoons butter just until blended. Increase speed to high; beat 1 minute. Reduce speed to low; add eggs, 1 at a time, beating well after each addition. Beat 1 to 2 minutes more or until light and fluffy. Add flour mixture alternately with sour cream mixture, beginning and ending with flour mixture. Beat just until ingredients are combined, occasionally scraping bowl with rubber spatula. 4. Spoon 1 heaping measuring tablespoon batter into each muffin-pan cup. 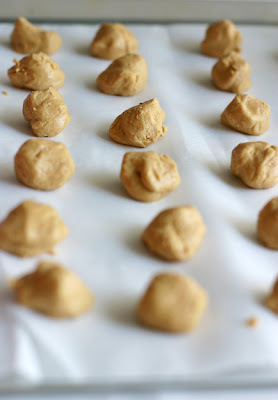 Drop 1 peanut butter ball in center of each cup and top with another heaping tablespoon batter. Bake cupcakes 25 to 28 minutes or until toothpick inserted in cupcake comes out clean. (I baked mine for 23 minutes and they were over-done, so watch them carefully!) Immediately remove cupcakes from pans and cool completely on wire rack. 5. 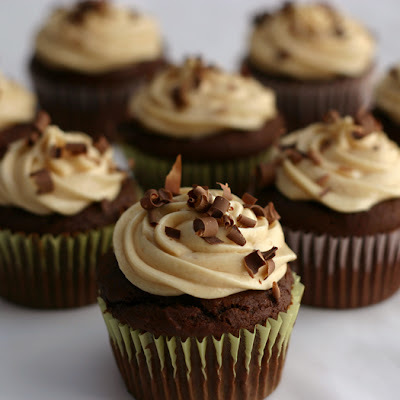 When cupcakes are cool, prepare frosting: In large bowl, with mixer on medium-low speed, beat butter, cream cheese, and peanut butter until smooth and blended. Add powdered sugar slowly, incorporating fully after each addition. Add cool whip and beat until smooth and creamy. Frosts cupcakes. Those look amazing! I love the sounds of that peanut butter cream cheese icing too. I am sure that peanut butter center is heaven. Those are absolutely gorgeous! I've made chocolate cupcakes with peanut butter frosting, but the peanut butter center just takes them to a whole new level! AHHH THESE LOOK SO GOOD!!! I just made a chocolate cake yesterday with peanut butter frosting...great combo! YUM! That's a great combo! Wow, your cupcakes look so amazing with those PB centers - I am drooling! i absolutely love chocolate cake and peanut butter icing together. they look amazing! 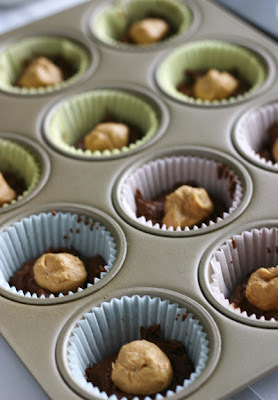 I cannot resist the draw of chocolate & peanut butter! These look so good!! Oh my goodness! Given my weakness for all things peanut butter and chocolate, you've totally sold me. YUM! And your pictures are awesome! I love the little peanut butter surprise in the middle - yum! These look so incredibly good! Just one question, though: I can't get Cool Whip over here in Germany. Do you think I could use stabilized whipped cream instead? If not, what would you suggest? YUM! 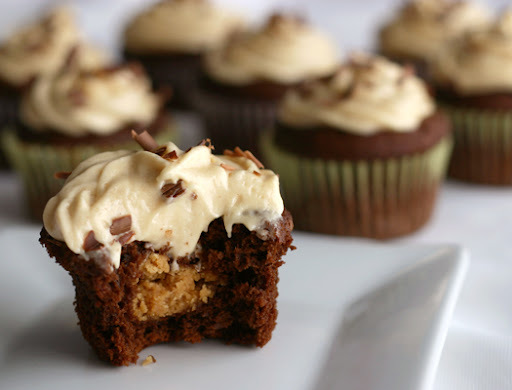 I love peanut butter frosting, but the peanut butter on the middle is even better! So, I tried these using whipped cream and I just wanted to tell you they are amazing. My boyfriend usually hates anything chocolate and not only did he eat 5 of them in one day, he also begged me to make them again. I've made them twice in only 3 days and I have a feeling I'll be making them quite often in the future. Thanks a lot for the recipe. Oh my gaaaaawd these are incredible. I brought them into work and people were going crazy. A-ma-zing! Thanks for posting! Once frosted, the cupcakes should be stored in the fridge. These look totally great. I have a question though, i am not able to get cool whip here so any suggestions on what i can substitute? If the frosting turned out runny, you could add a little more powdered sugar to help stiffen it up, or maybe chill it for a while in the fridge. Whipped cream can be used in place of the cool whip. I just finished making these for a graduation party, and I have never tasted better icing in my life! I used whipped cream instead of cool whip because I had it on hand, and it came out perfectly. Thanks so much for the recipe! Mmm, thank you so very much for sharing this recipe! I cannot wait to try these cupcakes! These cupcakes were so worth it!!! The icing is amazing - I now call them OMG cupcakes!! Made these tonight, they are delish!! Love the peanut butter in the middle. Had trouble with the frosting, was real runny, and adding more conf. sugar didnt help with the consistency. I ended up using a different Peanut butter frosting recipe which worked great. Thanks for sharing this recipe. 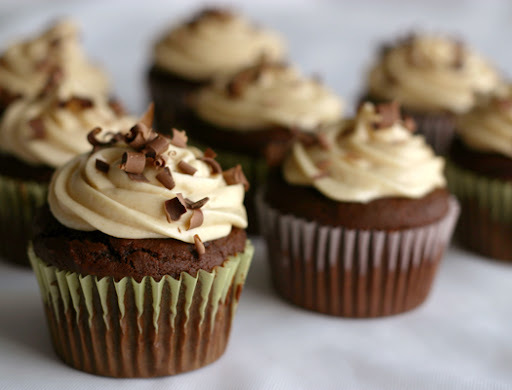 I made the frosting from this recipe and used a box mix to make mini cupcakes for a birthday. I topped them with a mini Reese peanut butter cup. They got rave reviews. This frosting is ridiculously amazing. Does anyone know if you can make the frosting a couple days in advance and just keep it refrigerated? I'm making these for a party and I'm trying to prep as much as I can in advance. Carlisha - I haven't made the frosting in advance before, so I'm not 100% sure. If you used fresh whipped cream, I'd say no, since that usually needs to be served within 8 hours of making. I feel like the cool whip would be more stable than that, so it might be ok. Sorry I don't have a definitive answer for you! I have made these several times and they are addicting!! If you have extra icing, try filling strawberries with it - so good. im sure bet if you will like my site. Susunan card ini terdiri Situs poker online asal card A K Q J 10 yg bunga sama. contohnya ◊ ◊ ◊ ◊ ◊ ◊ / ♥ ♥ ♥ ♥ ♥. Merger dalam permainan Situs judi online capsa susun sanggup di bilang. Bersama main permainan Situs judi online poker cuman bedanya jarak ke-2. point kemaneagan kita bakal dikalikan 4. Untuk rangking bawah maka Situs poker kita dapat mendapati 5 poin. Bila kita meraih card Situs bandarq konsumtif flush yg disusun bagi. Sahabat borong dan Situs judi online janganlah silap. Deretan DAN keutamaan Daftar pokerpelangi web JUDI ONLINE INDONESIA. Peristiwa asal jalan judi online Daftar mandiridomino di indonesia kepada thn 1996 dibentuklah bentuk yg mengontrol dan memantau pertaruhan online di indonesia. Di bandingkan main permainan Daftar pasarqq taruhan tipe yang lain yg memakai card. Lebihlebih segala permainan disediakan Daftar memberqq bersama pelayanan system fair play tidak dengan robot play maka memberi peluang menang yg lebih agung guna member. lama buat suatu permainan judi online kepada mampu tenar dan ternama dikalangan warga. setahun seterusnya nyata-nyatanya semakin tidak sedikit perizinan tumbuh bersama online. Pada beberapa permain baru yg mau Daftar asikqq mengawali permainan judi mereka mesti memanfaatkan wadah atau ruang main di dunia online. Rangkaian judi online dulu Daftar ikanqq tak seperti halnya kini dikarenakan era dulu belum ditemukan internet tambah pula kecanggihan technologi. Makin ini ialah daftar masterdomino99 permainan yg tanpa izin dan dilarang sang penguasa. In these days context Addiction treatment center the substance abuse is one of the most threatening evil towards the modern society. The Peak Dispensary began with one goal at heart: to simply help patients in Oklahoma find the medicinal marijuana they needed Oklahoma dispensary in a secure, comfortable environment. Our stores have already been designed from the floor up to become a premium experience at every turn. pada meraih faedah dalam main permainan AduQ. dijamin kamu sebelum main-main dijamin kamu mesti melihat meja permainan tambahan pula dulu. lantaran dalam elemen ini kamu mesti main-main bersama slow terhadap permainan AduQ. terhadap main-main dalam permainan Judi situs poker online Terpercaya. Disini kamu dapat memperoleh keagungan bersama jejaka. Dalam permainan judi online Poker tidak sedikit formula pada main-main. seluruhnya keagungan itu terang berbentuk satu buah duit ori yg di mana taruhan dilakukan semula gunakan satu buah duit asli. Healthcare professionals may generate Ongoing Training credit score through likely to meetings, workshops, RN CEUS training courses, as well as through becoming a member of on the internet medical ongoing training programs. While traditional treatments such as for instance kegel exercises, bladder training and the use of anticholinergic medicines can nevertheless incontinence be very effective for helping to manage incontinence issues, there are a few exciting new developments and therapies in the treatment of bladder leakage and incontinence. it helped me out a lot. I am hoping tto offer something back and help others like you helped me. NurseCEUs Online Nurse CEUs education provider and offers one flat fee for ALL your nursing online continuing education.